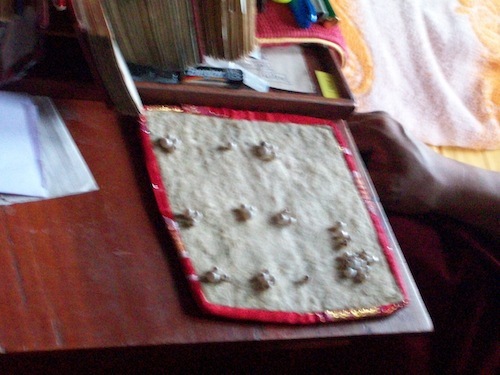 This article will discuss the performance of lde’u ‘phrul, a variant of Himalayan pebble divination, as it is practiced in the Bon community surrounding sMan ri monastery near Solan, Sirmour District (H.P. ), India. Drawing from several divination texts and fieldwork conducted at sMan ri monastery, this article will discuss the methods of casting and the symbolism evoked in supplying the divination’s clients with prognostications. Cet article s’intéresse à l’art de la divination lde’u ‘phrul, un type de divination réalisée au moyen de petits cailloux de l’Himalaya, tel qu’il est pratiqué dans la communauté Bon vivant aux environs du monastère de sMan ri, à proximité de la ville de Solan, dans la région du Sirmour (H.P.) en Inde. Cet article fondé sur des textes portant sur l’art de la divination ainsi que sur une enquête de terrain effectuée durant plusieurs mois à sMan ri, s’intéresse aux pratiques de la divination lde’u ‘phrul et à leur symbolisme. 1To my knowledge the American anthropologist Victor Turner (1975) was the first to argue that the symbolism used in divination is markedly different from other forms of ritual discourse. With regard to the field of Tibetan Studies and its growing interest in representations of Bon culture, a conceptualization of the exegetic value of divinatory symbolism is of immense importance. Despite the number of excellent studies on the subject of Tibetan divination practices (Thomas 1957, Macdonald 1971, Ramble 1993, 2008, Walter 1995, Yao 1997, Mortensen 2006, Dotson 2007, to name just a few), it is quite difficult to find a dedicated analysis of the symbolic complexes evoked in the performance of divination. With an eye towards this new and interesting field, the present paper will address a form of pebble divination known as "manifestation of knowledge" (lde’u ‘phrul [pronounced de’u trül]) as it is performed in the contemporary Bon community surrounding sMan ri monastery near Solan, Sirmour District (H.P), India. 2The paper will be divided into three sections. First, it will provide a brief ethnographic account of sMan ri monastery and the nearby village, Dolanji. Second, the paper will address the performance of lde’u ‘phrul divination. This analysis will focus upon the divination’s required implements, invocations, and the method of casting. Third, the paper will present a discussion of the divination’s symbolism. It will be shown that lde’u ‘phrul employs a wide range of culturally specific metaphors and symbols in the production of its prognostications. Drawing from a pair of lde’u ‘phrul manuals, the paper will attempt to explicate these symbolic configurations and chart their relationship to well known astrological schemas, such as the ‘nine numerological squares’ (sme ba) and the trigrams (spar kha). Before beginning, however, it is necessary to stress the limited scope of this study, which will only address lde’u ‘phrul performances as observed within a single monastic environment. As such, the paper will avoid any broad sweeping characterizations of pan-Himalayan pebble divination. These would be misleading in that there have been no other scholarly studies on the subject at hand.1 I shall now make a few ethnographic remarks concerning sMan ri monastery so as to put the following study in context. 4There are a number of forms of divination practiced in the broader community surrounding sMan ri. The foremost among these are dice divination (sho mo) and rosary divination (‘phreng mo), which are performed either by a specialist or requested from any monk versed in the practice. By and large, however, the most sought after form of divination is a variant of pebble divination referred to as lde’u ‘phrul, of which the foremost specialist in the community is the monastery’s head educator, the sMan ri Slob dpon ‘Phrin las nyi ma.4 It is perhaps of note that the majority of the Slob dpon’s clients are from the local community. However, with the introduction of mobile phones and the recent availability of internet at the monastery, the Slob dpon is receiving a steadily increasing volume of international requests for the performance of divinations. Beyond this, divinations are also requested by members of the monastic community on behalf of their families. As such, the Slob dpon administers to patrons from a number of different countries and different socio-economic backgrounds. 5The divination practiced by the sMan ri Slob dpon ‘Phrin las nyi ma is called "manifestation of knowledge" (lde’u ‘phrul). It is important to note, however, that the practice also goes by a number of different names. First of all, the divination possesses the phonetically similar spelling of rde’u ‘phrul (magic pebbles). Secondly, it is not uncommon to hear the divination called "six stones" (rdel drug),5 though the appearance of this moniker in writing is quite infrequent and carries a very specific connotation.6 Thirdly, it is commonplace among educated monks to hear the practice referred to as "the pebble divination of the Ma sang" (ma sang rdel mo).7 This title is a likely reference to one of two things: (1) a mythic location where sTon pa gShen rab, the founder of the Bon religion, is said to have conducted teachings on divination;8 (2) a class of semi-divine beings popular in Bon po mythology.9 Finally, the rite is occasionally rendered as "the divination of sMra seng" (sMra seng rdel mo). The term sMra seng is likely a foreshortening of the epithet "lion of speech" (sMra ba’i seng ge), which serves inter alia as an appellation for the Bodhisattva Mañjuśrī, as well as for an emanation of sTon pa gShen rab as a codifier of the first four vehicles of the Bon religion. In any case, for the sake of simplicity and as each of these terms refers to an identical practice, the term lde’u ‘phrul alone will be used in this paper’s discussion of the divination and its auxiliary materials. 6Broadly speaking, lde’u ‘phrul may be understood as a form of cleromantic divination. That is to say, a form of divination that involves the casting of lots, dice, stones, bones, or other mobile elements in order to conduct a divinatory reading. As such, cleromantic practices often utilize an element of chance, which is interpreted as revealing the will and foreknowledge of supernatural forces. lDe’u ‘phrul is also a form of textually oriented cleromancy. Thus, following a casting, the diviner refers to a specific divination text in order to interpret the random patterns formed by the rite’s mobile elements. 7Beyond the appropriate texts, lde’u ‘phrul also requires that one possess either forty-two white pebbles or forty-two beads from a crystal rosary. These objects should be spherical and roughly one centimetre in diameter. In the case of pebbles, a certain number of stones should be painted black. Typically, this number is given as either two of the pebbles or half of the pebbles. This ‘painting black’ is accomplished by drawing small pips upon the objects in question, which are referred to as "eyes" (mig).10 In addition to the stones or crystals, one requires a white felt mat that should be square and roughly twelve to fifteen centimetres across. In the performance of a lde’u ‘phrul casting, following the completion of the preliminary recitations, the pebbles are cast upon the mat and divided into nine piles using a simple process of division and subtraction. 8With the exception of telephone requests, the lde’u ‘phrul rites that I have observed proceed in the following fashion. To begin with, a client arrives and petitions the Slob dpon for an audience. The process governing this petition is no more complex than an exchange of formal greetings. Following this, the client is typically expected to produce a small monetary offering to the monastery. Irrespective of the amount, this gift is accepted. The Slob dpon then inquires into the nature of the client’s query. This questioning can proceed for some time until both the specific nature of the client’s question and the circumstances surrounding it are completely divulged. When this conversation reaches its conclusion, the casting is performed. 9To begin a lde’u ‘phrul casting, the Slob dpon first lays out the white mat between himself and his client. The pebbles are then placed in his hand. While holding the stones and reading from a divination text, the Slob dpon will recite a series of invocations that address a wide variety of divinities. As these invocations appear to follow a similar structure, perhaps two examples will suffice to demonstrate their general character. 13Once the casting is completed, one may refer to a lde’u ‘phrul manual in order to interpret the numerological patterns formed by the nine piles of stones. 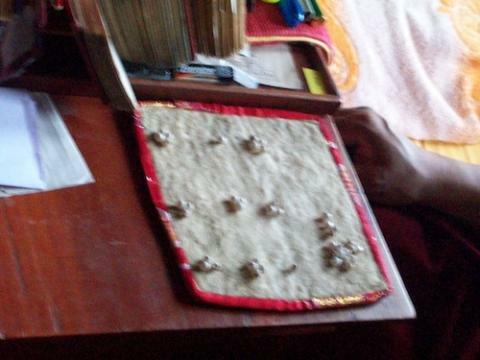 Generally speaking, the number of stones in each pile and its location upon the divination mat are taken together as an indication of a particular symbol. As these symbols are integral to the interpretation of a casting, it is necessary to address the symbolic content inherent to each of the nine piles of stones, which I will refer to as the nine sections of the divination grid. 14lDe’u ‘phrul manuals contain a series of passages that ascribe distinguishing characteristics to each of the divination grid’s nine sections. 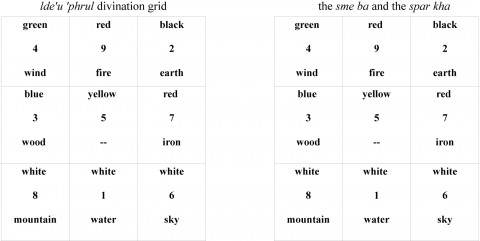 Most importantly, each vertical column of stones in the grid is given a title. 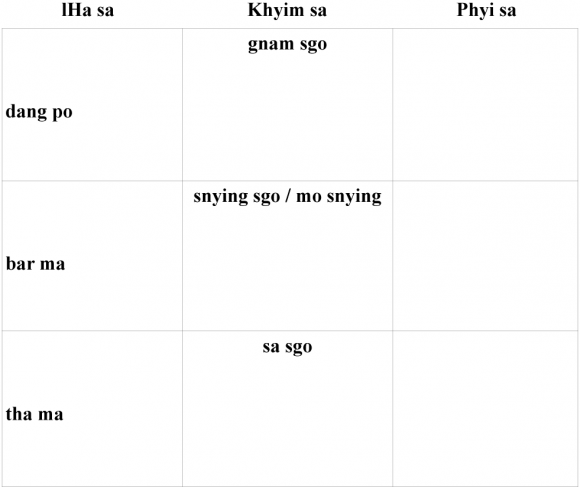 Starting from the left side of the grid, the first vertical column is referred to as "the Gods’ Place" (lha sa); the second column is called "the Family Place" (khyim sa); and the third column is referred to as "the Outside Place" (phyi sa). Each of these columns is then ascribed a specific set of values. The Gods’ Place, for example, is understood to represent the masculine or masculine values. The Family Place represents the feminine and the hearth, while the Outside Place is taken to represent possible misfortune. 15Beyond a division into three vertical columns, each of the divination grid’s horizontal rows also bears a title. Simply put, beginning with the top row, these are referred to as the "first" (dang po), the "middle" (bar ma or ‘bring po), and the "last" (tha ma). 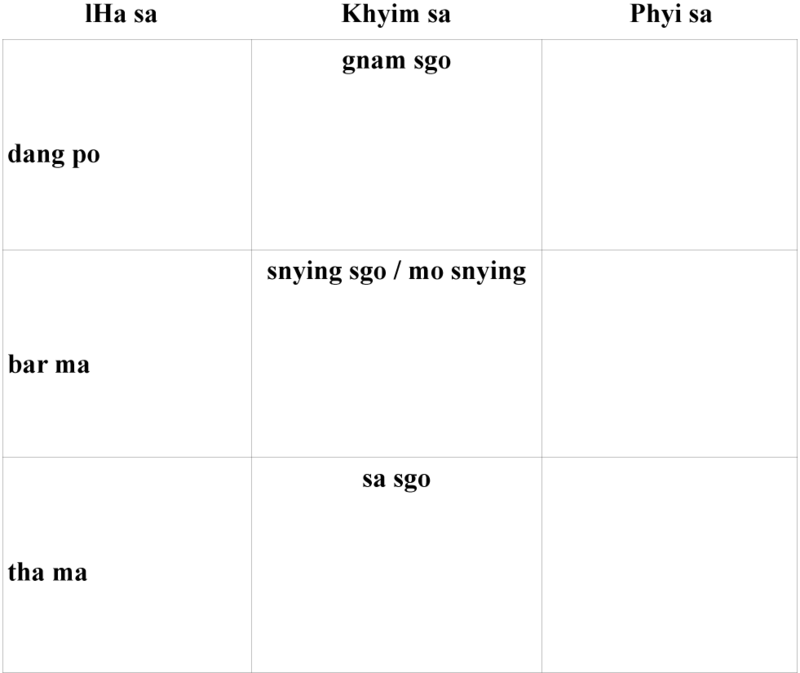 In this fashion, the upper left section of the grid is given the title "the First Gods’ Place" (lha sa dang po), the bottom right section is "the Last Outside Place" (phyi sa tha ma), and so forth. Finally, the three vertical sections of the Family Place are given a second set of titles: the First Family Place is "the Sky Door" (gnam sgo); the Middle Family Place is "the Heart of the Divination" (mo snying); and the Last Family Place is "the Earth Door" (sa sgo).22 These signifiers are illustrated in Figure 1. 25 With regard to the terms phywa and phya, see Karmay 1998, p. 247 n. 9. 26 Chung sri: a type of demon that is considered to prey on children (Norbu 1997, p. 46). 18In this sense, negative castings tend to begin with a series of misfortunes and malignant forces that loom in one’s immediate future. These are proceeded by a list of specific ritual activities that one may perform in order to ward off future tribulations. 19In interpreting a lde’u ‘phrul casting, the Slob dpon must gauge the relationship of negative to positive results and contrast these with their relative location within the divination grid. Drawing from the above examples we can see how each individual section of the grid may be understood. However, we have not yet addressed the method through which the dissonant sections of the grid are transformed into a cohesive and ordered narrative. In order to do this, the paper will now turn to a discussion of divinatory symbolism. In particular, it will focus upon a configuration of symbols expounded upon at length in lde’u ‘phrul texts, yet, visually inconspicuous during the rite’s performance. 30 Ku and bswo are common onomatopoeic terms representing war-cries. 21In this example, the Middle Gods’ Place is first described as a martial deity. Following the listing of the deity’s attributes, the text ascribes five symbols to the Middle Gods’ Place: a direction (east), a number (three), a color (deep blue), a trigram (tsin) and an element (wood). Narrated in this fashion, variations of these symbols appear in each section of the divination grid. 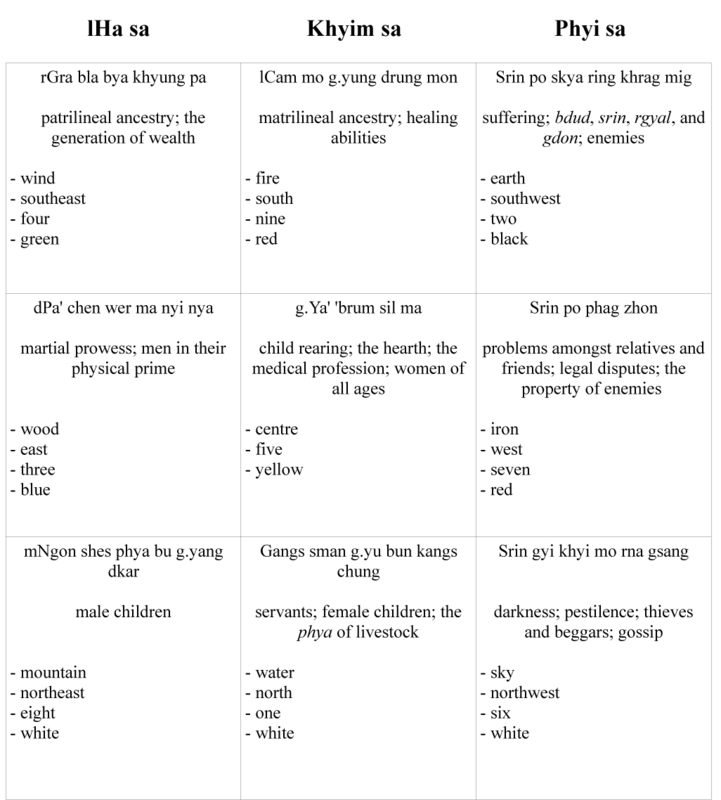 Rather than belabor the reader with a dense compilation of names and terms, a complete list of these variables and their relative location within the divination grid is presented in Figure 2. Seen in this fashion, it is quite clear that the grid is not composed of an entirely random configuration of symbols. On the contrary, it appears that lde’u ‘phrul texts outline a specific symbolic configuration that is encoded within the secret symbolism of the divination stones. 22Having presented Figure 2, several aspects of the divination grid are of particular importance. To begin with, it may be noted that Figure 2 bears a certain resemblance to an elementary maṇḍala. The division of the area into nine spaces, the presence of deities in each of these spaces, and the inversion of cardinal and inter-cardinal directions are all, for instance, features common to maṇḍalas found within the Tibetan cultural sphere (Snodgrass 1992, Tucci 1961, Macdonald 1997, Beer 1999, Huber et al. 1999). In addition to this material microcosm, the divination grid contains a number of elements representative of the human condition. The Gods’ Place and the Family Place are taken, for example, to represent the three stages of the human life-cycle: youth, maturity, and old age. Concurrently, the Outside Place is composed of the evils that may afflict an individual during these three stages of life. Taking these factors into consideration, it appears that lde’u ‘phrul texts dictate inter alia the construction of a material representation of the cosmos and of the individual’s life-cycle within it. 23Beyond the symbolic configuration of a microcosm, the attribution of a color, a number, and an element to each of the diagram’s nine sections is also of interest. As illustrated in Figure 3, the distribution of these elements in the divination grid is virtually identical to the arrangement of a particular numerological device encountered in Tibetan astrology: the ‘sme ba square’ (Norbu 1997, pp. 152-156 ; Cornu 2002, pp. 102-125 ; Beer 1999, pp. 121-122). Though this is not the place to venture into a cumbersome discussion of Tibetan astrology, perhaps a few brief remarks concerning the sme ba and their relationship to the trigrams (spar kha) will serve to clarify the symbolic content of the divination grid. 24A sme ba square is formed by placing the numbers one to nine along with their correlate colors into a three-by-three grid in which each column (horizontal, vertical, and diagonal) can be added together to produce the sum of fifteen. Numerologically speaking, this grouping possesses a great deal of symmetry: the base of three multiplied by the central five equals fifteen; the number five serves as a midpoint between both one and nine an three and seven; and the central five may be multiplied by the number nine to produce forty-five, which is identical to the sum total of the digits of the sme ba square (Beer 1999, pp. 121-122). Furthermore, taken together with the eight trigrams (spar kha), which may be added to the square’s cardinal and inter-cardinal points, the sme ba form the basis of a number of different methods of astrological calculation, the most common of which is perhaps the one hundred and eighty year cycle (sme ‘khor) and its division into three sixty year groups (sme phreng) (Norbu 1997, Cornu 2002). 25With the above configurations in mind, it is now possible to make several remarks concerning the overarching structure of lde’u ‘phrul symbolism. This article has shown how, following the performance of a lde’u ‘phrul casting, each pile of stones is understood to possess a particular meaning determined by its number and relative location. In addition to the constellation of meaning present in the divination stones, an analysis of lde’u ‘phrul texts also demonstrates that the divination’s performance involves the creation of a microcosm that encompasses both social and cosmic dimensions. The symbolic representation of this microcosm was then shown to overlap with the sme ba and spar kha, which are combined in the formation of an astrological diagram capable of representing the past, the present, and the future. The simultaneity of these symbolic configurations demonstrates, to say the least, the complexity of the rite’s analytical aspects.33 It also emphasizes the particular expertise of the diviner in his capacity as a bricoleur, brining an ordered and sequential meaning to the simultaneity of the divination’s overdetermined symbolic content. 26The similarity of divinatory diagnosis to bricolage has been well noted (Parkin 1991). As a bricoleur, the practitioner of divination expresses analytical creativity by fashioning a recognizable narrative out of the "debris and chaos" of mixed metaphors, homologies, and culturally specific images (Parkin 1991, p. 183). In its similarity to myth-making, the work of the ritual bricoleur has been compared to that of an artist, creating new works from a sphere of pre-existent imagery and narrative content (Lévi-Strauss 1966). With regard to the interpretation of lde’u ‘phrul, it is now clear that the diviner possesses a vast reservoir of culturally specific symbolism from which to craft the divination’s product: a response to the client’s query. 27In its similarity to bricolage, the technique of divinatory interpretation is as much an art as a science. As such, a full exegesis of the diviner’s analytical methods is well beyond the scope of the present paper. Nonetheless, this article has attempted to cast light upon lde’u ‘phrul divination’s content and creative potential. In addition to conducting a study of the divination’s performative dimensions, it has been argued that lde’u ‘phrul texts outline a number of symbolic configurations that provide a temporal, social, and cosmic framework within which to correlate the results of each casting. While such devices are by no means unique to the performance of lde’u ‘phrul,34 their presence demonstrates the richness of divinatory symbolism within the Bon milieu. It is sincerely hoped that such divinatory practices will come to be exposed to academic scrutiny not only into their social dimensions, but also as carriers of culture that preserve the often unarticulated discourse of mythology and symbolism. 1999 The Encyclopedia of Tibetan Symbols and Motifs (Boston, Shambhala Publications, Inc). 1987 The Social and Religious Identity of the Tibetan Bonpos with Special Reference to a North-west Himalayan Settlement, D.Phil Thesis, University of Oxford. 1993 The Social and Religious Identity of the Tibetan Bonpos, in Charles Ramble and Martin Brauen (eds). Anthropology of Tibet and the Himalayas (Zürich, Ethnologische Schriften Zürich), pp. 39-48. 2002 Tibetan Astrology (Boston, Shambhala Publications Inc). 1985 Perspectives on Divination in Contemporary Sub-Saharan Africa, in W. van Binsbergen and M. Schoffeleers. Theoretical Explorations in African Religions (London, KPI/Routledge and Kegan Paul), pp. 50-83. 2007 Divination and Law in the Tibetan Empire: the Role of Dice in the Legislation of Loans, Interests, Marital Law and Troop Conscription, in Matthew T. Kapstein and Brandon Dotson (eds), Contributions to the Cultural History of Early Tibet (Leiden, Brill), pp. 3-77. 1994 ‘Port de la Terre, Porte du Ciel’, un rituel de rançon au Ladakh, in Per Kvaerne (ed), Tibetan Studies: Proceedings of the 6th Seminar of the International Association for Tibetan Studies (Oslo, Norway, The Institute for Comparative Research in Human Culture). 1999 Sacred Spaces and Powerful Places in Tibetan Culture: A Collection of Essays (Dharamsala, India, The Library of Tibetan Works and Archives). 1998 The Arrow and the Spindle: Studies in History, Myths, Rituals and Beliefs in Tibet (Kathmandu, Mandala Book Point). 2007 A Historical Overview of the Bon Religion, in Samten G. Karmay and Jeff Watt (eds), Bon the Magic Word: The Indigenous Religion of Tibet (London, Philip Wilson Publishers Ltd.), pp. 55-82. 1958 Fiefs, Poisons et Guérisseurs, JA, Tome CCXL VI-2. 1966 The Savage Mind (London, Weidenfeld and Nicholson). 1997 Maṇḍala and Landscape (Delhi, D.K. Printworld Ltd.). 1971 Une lecture des Pelliot tibétain 1268, 1287, 1038, 1047, et 1290: Essai sur la formation et l’emploi des mythes politiques dans la religion royale de Sroṅ bcan sgam po, in Études Tibétaines dédiées à la mémoire de Marcelle Lalou (Paris, Adrien Maisonneuve), pp. 190-391. 1979 Choix de documents tibétains conservés à la Bibliothèque nationale (Paris, Bibliothèque nationale), vol. II. 2006 Raven Augury from Tibet to Alaska, in Waldau, Paul and Patton, Kimberly (eds), A Communion of Subjects: Animals in Religion, Science, & Ethics (New York, Columbia University Press), pp. 421-438. 1998 Oracles and Demons of Tibet: The Cult and Iconography of the Tibetan Protective Deities (New Delhi, Paljor Publications). 1997 Drung, Deu and Bon: Narrations, Symbolic Languages and the Bon Tradition in Ancient Tibet (Dharamsala, Library of Tibetan Works and Archives). 2009 The Light of Kailash: a History of Zhang Zhung and Tibet, volume I (Merigar, Italy, Shang Shung Publications). 1982 Straightening the Paths from Wilderness: Simultaneity and Sequencing in Divinatory Speech, in Paideuma 28, pp. 71-83. 1991 Simultaneity and Sequencing in the Oracular Speech of Kenyan Diviners, in Philip M. Peek (ed), African Divination Systems: Ways of Knowing (Bloomington and Indianapolis, Indiana University Press), pp. 173-190. 1991 African Divination Systems: Ways of Knowing (Bloomington, Indiana, Indiana University Press). 1997 Secret Games of the Gods: Ancient Ritual Systems in Board Games (York Beach, Maine, Samuel Weiser, Inc). 1993 Rule by Play in Southern Mustang, in C. Ramble and M. Brauen (eds), Anthropology of Tibet and the Himalaya (Zurich, Volker-kundemuseum der Universitat Zurich), pp. 287-301. 2009 Playing Dice with the Devil: Two Bonpo Soul-retrieval Texts and Their Interpretation in Mustang, Nepal, in Samten G. Karmay and Donatella Rossi (eds), East and West vol. 59 Nos. 1-4. Bon The Everlasting Relgion of Tibet: Tibetan Studies in Honour of Professor David L. Snellgrove. Papers Presented at the International Conference on Bon 22-27 June 2008, Shenten Dargye Ling, Château de la Modetias, Blou, France, pp. 205- 232. 1967 The Nine Ways of Bon (Boulder, Prajna Press). 1992 The Symbolism of the Stupa (Delhi, Motilal Banarsidass Publishers Private Limited). 1957 Ancient Folk-Literature from North-Eastern Tibet (Berlin, Akademie-Verlag). 1961 The Theory and Practice of the Mandala (London, Dover Publications). 1975 Revelation and Divination in Ndembu Ritual (Ithaca, New York, Cornell University Press). 1995 Scapula Cosmogrpahy and Divination in Tibet, in Kailash (http://himalaya.socanth.cam.ac.uk/collections/journals/kailash/pdf/kailash_18_0304_05.pdf). Last visited: April 2011. 1997 On the Origin of sho (dice) and shag (domino): Explorations in the Amusement Culture of the Tibetan people, in H. Krasser et al. Tibetan Studies: Proceedings of the 7th seminar of the International Association for Tibetan Studies, volume II, (Vienna, Verlag der Österreichischen Akademie der Wissenschaften), pp. 1055-1067. 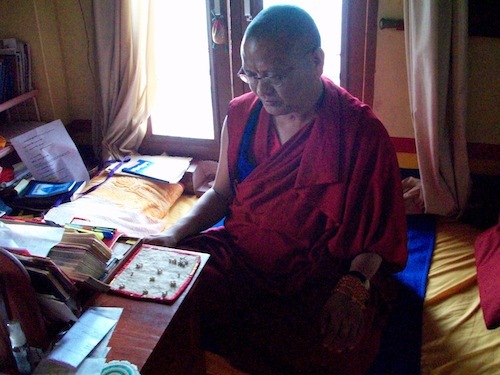 2008 The Bon Religion and the Tibetan Bonpo Foundation in India (Oachghat, India, Tibetan Yungdrung Bon Library). Kun grol grags pa. sMra sing rdel mo gsal ba’i me long bzhugs po, in Namdak, Tenzin. 1997 ‘Chi med mgon po tshe dpag med dang ma gshin gnyis kyi sgrub chog mo yig sna tshogs bcas kyi gsung pod: A collection of ritual and divinational texts of the "new" nob (Bon-gsar) tradition chiefly works by Rig-’dzin Kun-grol-grags-pa and Mi-shig-rdo-rje. (New Thobgyal, P.O. Ochghat, H.P., Tibetan Bonpo Monastic Center). rJe ‘brug chen po Khro tshang ‘brug lha. Ma sangs ‘phrul gyi rdel mo mngon shes rno gsal gyi sgron me zhe bya ba bzhugs pa legs po. 1 It is important to note that Chögyal Namkhai Norbu presents a cursory discussion of lde’u ‘phrul in two of his publications (1997, pp. 25-30; 2009, pp. 192-194). While these works are important contributions to the study of Tibetan culture, they clearly embody an emic presentation of the Bon po ritual milieu. 2 The Bon po settlement of Dolanji is known by a number of different names. In short, the Tibetan name for the settlement is "the New Thob rgyal" (Thob rgyal gsar pa), which refers to the Thob rgyal valley near the historical sMan ri monastery in Tibet (Cech 1987, 1993). According to Cech, "this name was adopted in the hope that the settlement would become the supporting estate of the new sMan ri monastery" (1987, p. 154). 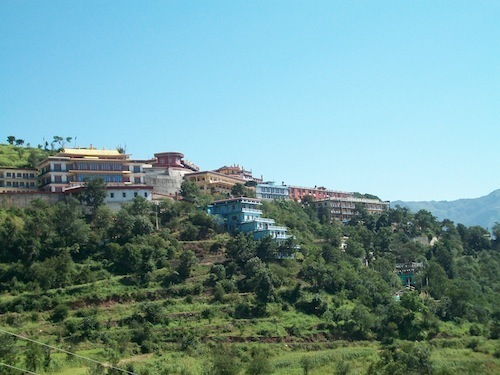 The site is also known in Tibetan as "the Solan Settlement" (Solan gzhis chags). However, a number of villagers use a more sectarian idiom in calling the site "the Bon po Settlement" (Bon po gzhis chags). The English name for the settlement is the Tibetan Bon po Foundation, which is the village’s official administrative title. Despite these various appellations, the most pervasive name for the settlement is clearly Dolanji, the original Indian name for the area (Cech 1987, pp. 154-155). 3 In surveying both Dolanji and sMan ri, I have been able to draw from a thorough census of the region that was undertaken by Dr. Krystyna Cech between 1985 and 1987 (Cech 1987, 1993). Despite the time that has elapsed since the publication of Cech’s research, with regard to the demographics of the local population, her study is still tremendously accurate. However, this research was conducted immediately prior to the establishment of a large orphanage in the village, which is referred to as the Bon Children’s Welfare Center (B.C.W.C.). While conducting my most recent research in Autumn of 2009, the B.C.W.C. supported nearly three-hundred children and a large number of staff in local dormitories. 4 I am grateful to the Slob dpon ‘Phrin las nyi ma for both his erudition and for his graciousness in allowing me to repeatedly observe divination sessions during the summer and autumn of 2009. I would also like to thank Professor Charles Ramble for helping me through the difficulties of translation and Dr. Katia Buffetrille for offering me a forum in which to present my work. 5 Chögyal Namkhai Norbu (1997) argues that the term lde’u ‘phrul is sometimes rendered as rdel drug because of an alleged phonetic similarity. He writes, "we can... assume that with the passing of time the pronunciation involuntarily changed and simplified, and [rdel drug] being easy to pronounce and simple to understand, those people who did not know the meaning of the word altered the original spelling, giving rise to the perpetuation of the mistake" (1997, pp. 26-27). Upon reflection, the phonetic dissimilarity of these two terms seems to indicate that Norbu’s argument is a simplification. It is tempting to hypothesize that these two terms may represent the homogenization of previously dissonant pebble divination practices. However, the matter clearly requires further study. "(1.3.2) six stones like this is highest. For whatever mo is cast, this is excellent". (132) ‘di ‘dra’i rdel drug rab yin pa’i / ci tab ci yi mo la bzang (MSI, XV). This passage depicts the horizontal arrangement of three piles of stones numbering one, three, and two as possessing an analytical value that supercedes the symbolic content of each individual pile. In this sense, the term "six stones" is clearly used in the performance of lde’u ‘phrul. Apparently, however, it serves only to characterize the arrangement of particular piles of stones within the divination grid at large. 7 It is important to note that the orthography of divination manuals is notoriously inconsistent. As such, Ma sang rdel mo is often rendered Ma sangs rdel mo. 8 The mythological region of Ma sang is often considered to be a location visited by either sTon pa gShen rab or Confucius (Kong tse ‘phrul gyi rgyal po). During this visit, the figure in question is said to have conducted divinatory teachings on the subject of pebble divination. For example, the following passage presents a Bon po ontology of the dissemination of divinatory traditions. "In the land of Zhang Zhung he systematized rope divination (ju thig). In the land of China he systematized hydromancy (chu zhags). In the land of Ma sang he systematized pebble divination (rdel mo). And in the land of Ye nyag he systematized scapulomancy (sog mo)". zhang zhung yul du ju thig gtan la phab / rgya yi yul du cho zhags ba gtan la phab / ma sang gi yul du rdel mo gtan la phab / ye nyag ki yul du sog mo gtan la phab / (MSA, V). 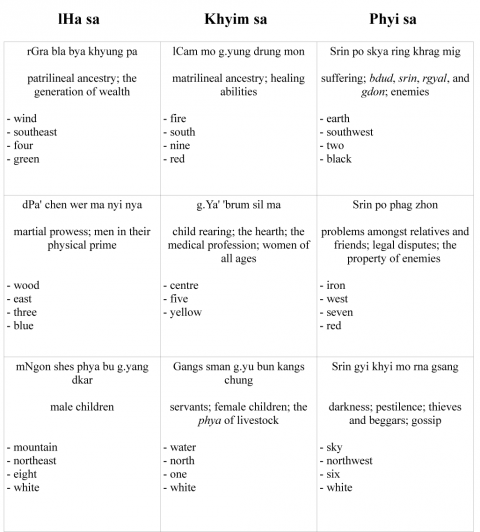 9 Generally speaking, the Ma sang are considered to be a class of the’u rang deities, which belong to the broader category of the gNyan (Nebesky-Wojkowitz 1998, p. 625; Snellgrove 1967, p. 224). According to traditional narratives, the Ma sang are considered to have ruled Tibet during the pre-historical period (Norbu 1997, p. 229 n.63). 10 The presence here of both white and black objects is generally considered to be a necessity for the balancing of negativity and fortune in the divination (Personal communication from the Slob dpon). Also, with regard to the prevalence of dualistic imagery in the Bon tradition, see Karmay 1998, pp. 131-132. 11 As some of this article’s readership may be from a non-Tibetanist background, English translations are generally offered of the gods and demi-gods depicted in the divination texts. It is understood that literal translations of these terms are often simplistic and unsatisfactory. Where possible, additional references for specific terms will be supplied. 12 The gnod sbyin are equivalent to the Sanskrit yakṣa (Norbu 1997, p. 248; Nebesky-Wojkowitz 1998, p. 620). 13 The yul lha and gzhi bdag are two classes of highly localized and ancient territorial deities popular in both Bon and Buddhist traditions (Nebesky-Wojkowitz 1998, p. 387). 14 Here, mo translates simply as "the divination". In many contexts, phya denotes "luck, fortune, or the propensity towards fortune". In this passage, however, it seems to carry the same connotation as one sees in PT 1285 (Lalou 1957, pp. 42, 66, 86, 137) and PT 1047 (Macdonald and Imaeda 1979, pp. 331-349), where the term has been rendered as "prognosis" (Karmay 1998, p. 247). As such, the passage seems to indicate a desire that the deities be present at the "divination" (mo) and the ancillary provision of "prognoses" (phya). 15 It is important to note that this paper presents Tibetan sources in their original, unedited form. In the case of unclear or damaged sections, either a provisional transliteration or the number of missing syllables has been provided in closed brackets. 16 sku gsum rdzogs pa’i sangs rgyas dang / kon mchog gsum dang rtsa gsum lha / yid dam phyi nang gsal gsum dang / tsa rgyud bla ma bka’ skyong dang / dpal mgon ‘gur lha brten ma dang / lha klu gnod sbyin ga zla skar dang / yul lha gzhi bdag drag rtsal can / de ring mo dang phya la dbar / khyed ni thams mkhyen pa’i bdag / mi shes mi mthong gang yang med / bdag la dgongs pa’i dus byung na / bzang ngag gnyis kyis gshan byed la / bden rdzun legs nyes so sor ston / rno mthong mo ‘di gsal bar mdzod / (MSI, pp. ii-iii). 17 rlung mkhar gyi nang na bzhugs pa’i rje / mo lha’i rgyal po spyan ‘dren gyis / ye mkhyen ‘phrul rgyal gshegs su sol / ‘od gsal lha yi phreng nas / lha gar rten gsum gshegs su sol / rang bdus rin chen sku mkhar nas / thug kar sgra bla gshegs su sol / mo lha gsum bgya drug cu’i tshogs / ma thog smyur bar gshegs su sol / lha gzhi dkar po’i gong ‘dir bzhugs / phyag lo sdig bshags [bdran] yon ‘bul / rno mthong ston pa’i mo lha mdzod / bzang ngan ma nor gsal bar mdzod / legs nyes gnyis kyi dpang po mdzod / mo rdel ‘di la byin gyis rlobs / (MSA, p. iv). 18 de ltar bdar ba’i lha tshogs thams cad mdun gi nam mkha’ gang ba tsam dbyings nas byon te / ‘od du zhu nas rde’u la thim pas / (MSA, pp. xii-xiii). 19 It is important to note that the diffusion of power into the divination stones can be considered to place the burden of truth upon the deities in question. This provides lde’u ‘phrul with a natural non-falsifiability by directing any doubts concerning the practice’s veracity to secondary causes, such as the power of the deities and the correct performance of the invocations, rather than to the divination itself. 20 Ling tse is generally rendered as "lattice". In this context, however, the term refers to the nine individual sections of the divination grid. 21 de nas so sor dpyad pas rde’u bzhi bcu rtsa gnyis yod / tsho gsum gcad la / bzhi bzhir bgrangs / ling rtse dgu ru bab pa yin / (MSI, p. iii). 22 With regard to the ritual significance of "Sky Door" (gnam sgo) and "Earth Door" (sa sgo), see Dollfus 1994. 23 The wer ma are a common class of warrior gods (Karmay 1997, p. 257; Nebesky-Wojkowitz 1998, p. 629). 24 ‘di ru rdel gcig bab pa na / sgra bla wer ma’i mgon skyabs byed / lha srung sgra bla mchod na bzang / (MSI, p. iv). 27 According to Norbu (1997, p. 260 n. 21), it was customarily considered inauspicious for a bride to join her future husband while carrying "black utensils" (spyad nag). The presence of such objects was considered to be an evil omen. 28 gnyis bab srog phywa dgra phywar ngan /bu tsha dag la chung sri sdang / rta nor rtod phur ‘bud pa’i ngo / dgra rkun ngo che dgra bla brub bya / nad pa rang phyogs sri bu gdon / yang na byang shar ‘tshams phyogs nas / mo rigs sha dmar spyad nag / lam ‘phrang bcos shing tshe gzungs ‘don / ... khyed par glang lo pa la ngan / (MSI, vii). 31 In this passage the syllable indicating the relevant trigram is damaged and somewhat difficult to read. Based upon its location within the divination grid, however, the syllable is almost certainly tsin, which is aligned with the wood element and the eastern direction (Cornu 2002, p. 112). 32 lha sa ‘bring po’i bdag po ni / g.ya’ spang rkyes gcig zer ba de / dpa’i chen wer ma nyi nya yin / seng ge’i mgo la dbyi yi rna / ral gri’i rkang la chu gri’i gshog / rkang pa rlung gi ‘khor lo can / nyi ma’i rmog chen dbu la gsol / skar ma’i grab chen [ ?] la mnab / dpa’ bo stag rgod dar ma bcibs / dmu ri de’u dkar rtse mo yi / gro chu dmu lugs mkhar la bzhugs / sgra bla yongs kyi dmag dpon yin / wer ma’i [ ?] dmag ‘bum gyis bskor / ku la dga’ zhing bswo la dgyes / skyes bu dar ma’i sgra bla yin / ... shar phyogs sum mthing [zhen] shing khams / (MSA, pp. xvii-xviii). 33 With respect to the discussion of analytical approaches regarding the study of divination, see Devish 1985 and Peek et al. 1991. 34 It is important to note that such schemata are not particular to lde’u ‘phrul nor to divinations conducted within the Bon po milieu. On the contrary, a number of scholars have argued that divination systems often contain material representations of the cosmos and of the place of social institutions within it (Turner 1975, Peet et al. 1991, Parkin 1982). Alexander K. Smith a terminé son M.Phil en tibétain et études himalayennes à l’Université d’Oxford en 2010. Il va commencer son doctorat à l’École Pratique des Hautes Études en 2011 sous la direction de Charles Ramble (D.E., E.P.H.E. ).